Round 7 of the Open and round 4 of the matches have just started. This time Peter Svidler opted for 1.Nf3 as the first move, and continued after 1...d5 with the currently quite popular and 'poisonous' 2.e3. 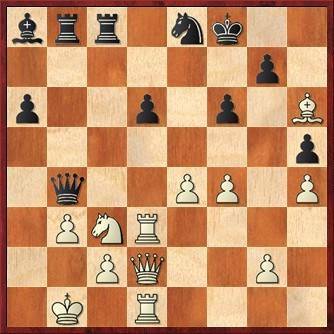 In the other match, again the Najdorf came on the board. 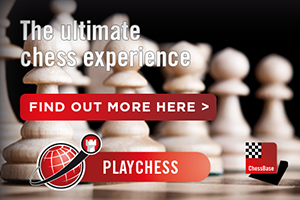 Unlike the 2nd game, where he played 7.f4 after 6.Be2 e6, Jorden van Foreest has now played 7.Be3. 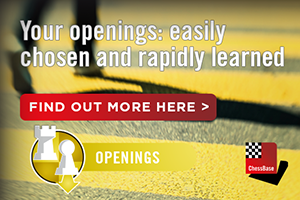 Today is an important day in the Open. After round 7, the first 4 players will qualify for the semifinals, which will be played tomorrow. We already have a few very quick draws: between Frenchman Hector Giacomini and Luuk van Kooten, and between Jonas Hilwerda and Peter Hulshof. At the moment there are some technical problems with boards 35-39. 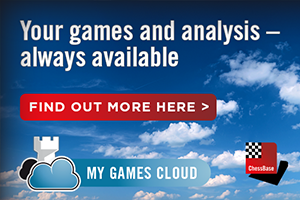 We will provide the game scores as soon as possible. No short draws after all! Hector Giacomini and Luuk van Kooten as well as Jonas Hilwerda and Peter Hulshof are still playing! The 2 draws I wrote about were also a technical glitch. Today's commentator Ivan Sokolov gave a very instructive analysis of the openings in both matches. 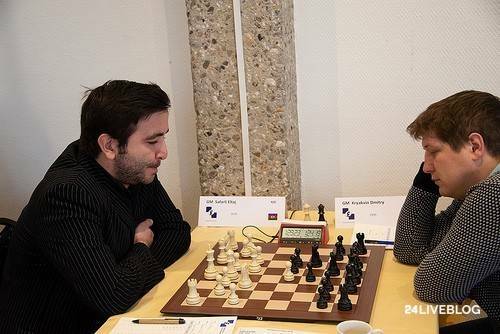 He argued that in the Scheveningen Sicilian that came on the board in Van Foreest-Fedoseev, Black's play may be even easier than White's since he has a clear plan: ...Rac8, ...Rae8 and ...d6-d5. 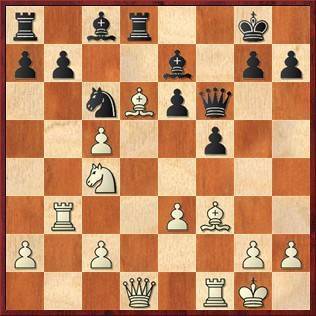 In Svidler-Shankland, White kept his d-pawn on d2 for a while because he may want a set-up with b2-b3, Bb2 and g2-g4, as was for example played in the recent important Olympiad game Nepomniachtchi-Bacrot (1-0). 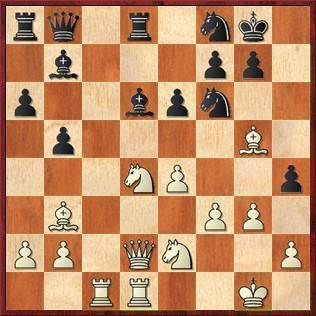 Shankland prevented this with 4...dxc4, opting for a Queen's Gambit Accepted set-up where White's knight is not great on c3. After ...b7-b5 White wants to play a2-a4, but in this case after ...b5-b4 the knight has to go back to b1 and he loses several tempi. When Svidler played 8.d4 after all, Black had no problems. 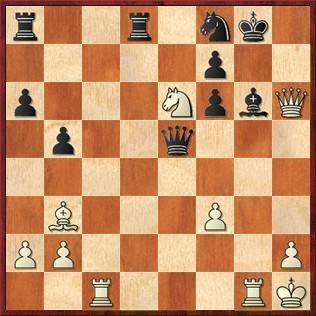 With the later 11.e4 White aims for e4-e5, but the American's reaction 11...cxd4 and 12...Bd6 was again spot on. 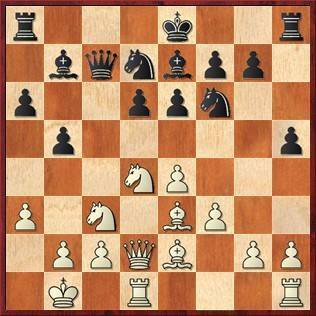 Sokolov: 'With the rook on d1 White now cannot play f2-f4 and has to do something against the threat on h2. 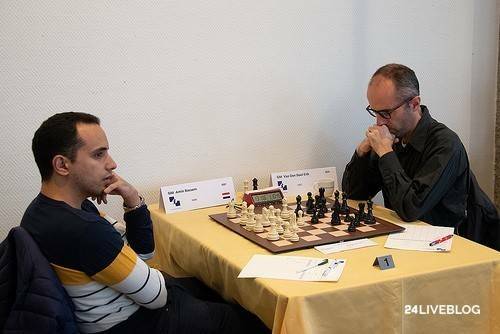 In the Open, some experts expected a short draw on top board because both Bassem Amin and Erik van den Doel have the best TPR and have good chances of qualifying for the semi-finals. But they seem to be going for it, although in a quite careful way. Now White can give a deadly check with 18.Bd5+ and then attack Black's f5 weakness with 19.g4 - the computer even suggests 18.g4 immediately. A feint by Van Foreest? There are already lots of interesting tactics possible in the game Van Foreest-Fedoseev. 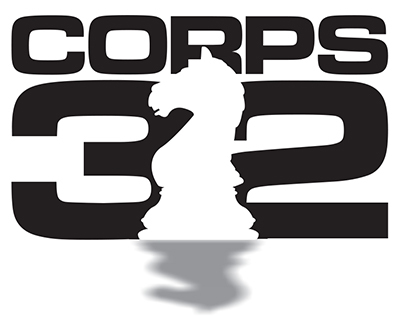 Tournament director Loek van Wely suggested the option of 13.Ndxb5 axb5 14.Nxb5 Qb8 15.Nxd6+ Kf8 here, with three pawns for the knight. and now thought for a while. Would Jorden sac on g7? No! He has retreated his bishop. Well, of course it often happens that we write something on the blog which is refuted soon after. Bassem Amin and Erik van den Doel have made a fairly quick draw, and now the others can try to play catch-up. 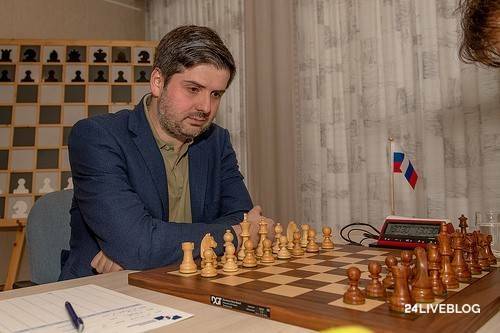 When Peter Svidler has a red face, walks around at a furious pace and sits with his head in his hands at the board, things seem to look terrible for him. But in the 8-fold Russian champion's case this usually means he is winning! He has invaded Black's weakened kingside with his queen. It looks extremely dangerous for Shankland. On move 19 he could have kept everything covered with 19...Be7 instead of the sharp 19...hxg3!?. Now the g-file has also been opened, and Sokolov ventured in the commentary room that Black won't survive this for long. Board 2 of the Open has also ended in a fairly quick draw. Nothing special, Dmitry Kryakvin whispered in the playing room. Apeldoorn teammates Max Warmerdam and Thomas Beerdsen have also already signed the peace treaty. 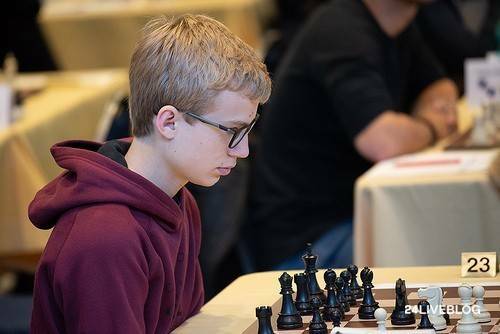 Jorden van Foreest may be regretting that he put his bishop on g5 instead of sacrificing it on g7. Now the bishop is closed in anyway and he has put it on h6, hoping to draw compensation from Black's shattered kingside. 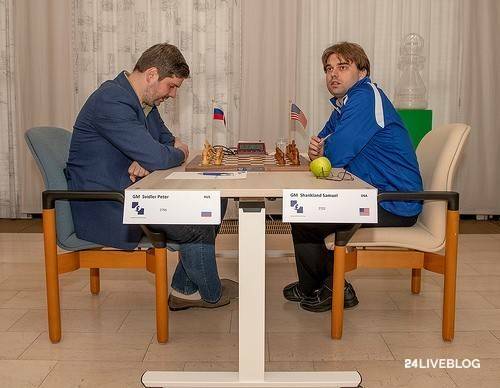 Peter Svidler just won a brilliant game, and he went to the commentary room to explain what happened. Svidler wasn't sure about 22... f5 23.Rg1 Bg7 24.Qh5 and now 24...fxe4, but after 25.Rxg3 exf3 26.Rxg7+! Black just gets mated. There are many wins here, including the flashy 28.Rc7, but now Black just gets mated. And Black resigned because of 32.Rg1. Van Foreest got enough compensation after his bishop was closed in, but on move 26 Fedoseev may have played not the best move. If, instead of taking on e4, he played 26...a5! 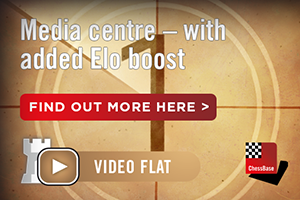 Black could continue his kingside attack and would have been clearly better. After 26...Bxe4 Van Foreest had a relatively easy task of winning a couple of pawns and exchanging queens, leading to a drawn endgame. 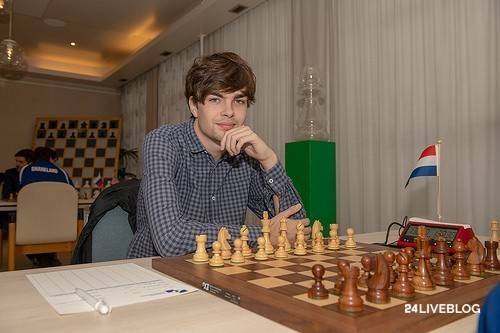 Also in the fourth match game Jorden van Foreest managed to draw after some hard work. Vladimir Fedoseev admitted that after 26...Bxe4 27.Nxe4 Qxe4 he had missed 28.f5!, which gives Black good compensation. Next, after 32.Qd5+ he thought he might have tried 32...Kh7 when Black is more active than in the game. 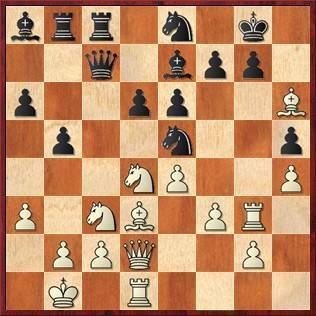 The players agreed that the sac 19.Bxg7 Nxg7 20.Qh6 Bf8 21.f4 would have been a better chance. 'This is complicated, and looks quite interesting', said Fedoseev. 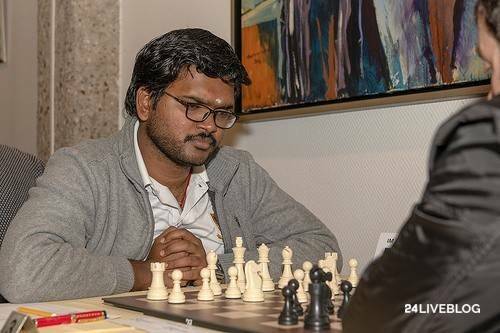 Van Foreest thought that after the move 26...a5! 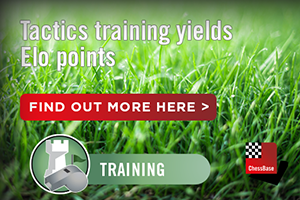 that we mentioned in the previous blog it would have been 'game over'. The games on all six top boards ended in draws, which means that the two top boards, Bassem Amin, Erik van den Doel, Eltaj Safarli and Dmitry Kryakvin go on to the semi-finals which will start tomorrow. 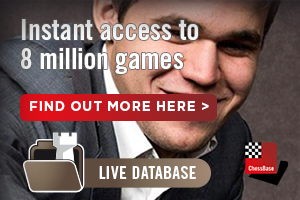 Peter Svidler took the lead in his match with Sam Shankland today with a brilliant win. In the commentary room he was beaming and showed the audience and commentator Ivan Sokolov a number of brilliant variations. 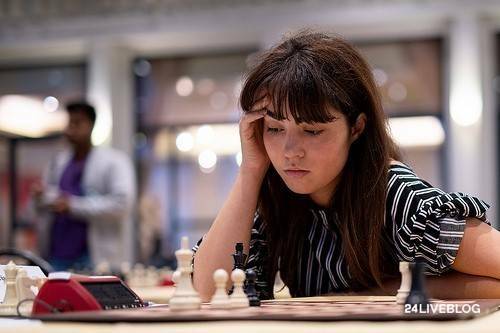 'But still I missed something also in this game', said the super-GM. 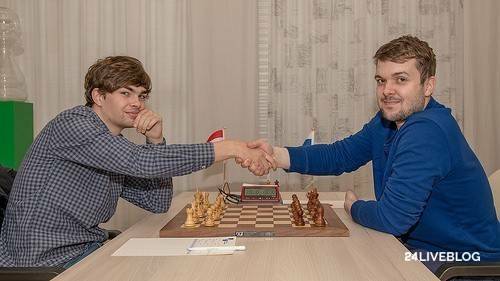 Jorden van Foreest again had to pull out all the stops to achieve a draw against Vladimir Fedoseev, but when the other Russian super-GM missed something on move 26 the Dutchman again managed to escape by a hair's breadth. In the Open, things were pretty quiet today at the top boards. Six draws were registered, which meant that the standings at the top of the list remained unchanged and Bassem Amin, Erik van den Doel, Eltaj Safarli and Dmitry Kryakvin qualified for what promises to be an exciting semi-final and final in the coming days.